SONESTA ES SUITES ORLANDO IS A COMPLETELY RENOVATED ALL SUITE HOTEL RIGHT ON INTERNATIONAL DRIVE ACROSS FROM THE ORLANDO EYE. 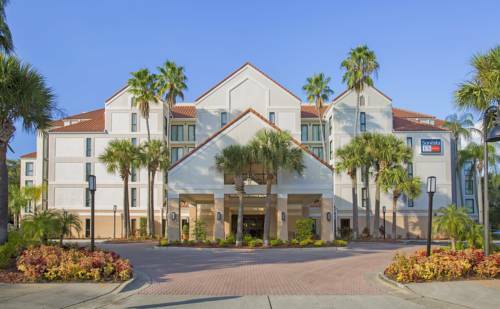 THE HOTELS OFFERS A CONVENIENT LOCATION NEAR WALT DISNEY WORLD THEME PARKS/UNIVERSAL ORLANDO/SEAWORLD ORLANDO AND THE ORANGE COUNTY CONVENTION CENTER. WITH A FRESH MODERN APPEAL / ALL GUEST SUITES / PUBLIC SPACE AND DINING OPTIONS HAVE BEEN COMPLETELY REIMAGINED. OFFERING BRAND NEW ONE AND TWO BEDROOM SUITES - SLEEPING UP TO 8 GUESTS / A COMPLIMENTARY UPGRADED BREAKFAST BUFFET EACH MORNING / A NEW TAKE ON HAPPY HOUR / ON-SITE CONVENIENCE STORE AND NEW LOBBY SMOOTHIE/COFFEE BAR. THE HOTEL ALSO OFFERS COMPLIMENTARY WIFI / ONSITE FITNESS ROOM / HEATED SWIMMING POOL / BUSINESS SERVICES / LAUNDRY. BUSINESS TRAVELERS AND VACATIONERS APPRECIATE THIS CONTEMPORARY HOTEL NEAR RESTAURANTS / SHOPS AND ATTRACTIONS EASILY WITHIN WALKING DISTANCE. Located on International Drive / Orlando FL. The hotel is central location / across from the orlando eye / is especially convenient to the Walt Disney World Theme Parks / Universal Orlando / SeaWorld Orlando and the Orange County Convention Center. Business travelers and vacationers appreciate the hotels convenient location with numerous restaurants / shops and attractions within walking distance along International Drive. Complimentary Fresh Breakfast Buffet Every Morning serving Hot and Cold Items. < 1 mile from Orlando.